Para table tennis is the third largest Paralympic sport in terms of athlete numbers and is practiced in more than 100 countries. In Rio de Janeiro there will be singles and team events for both men and women, with standing, wheelchair and intellectual impairment classifications. 269 athletes are participating in 29 medal events from 8 September until 17 September. 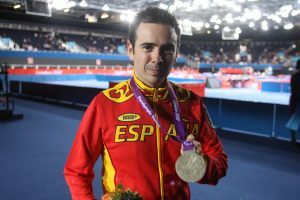 Interesting Story: Alvaro Valera has been a constant at the top in international competitions, holding gold medals from all major competitions. However at the Rio Paralympics he will go for his first gold since Sydney 2000. The year 2014 was one of Valera’s most successful, winning the world title, overcoming Denmark’s Peter Rosenmeier in the final, and also claimed gold in the men’s team event. These results earned him an ITTF Male Para Star Award. 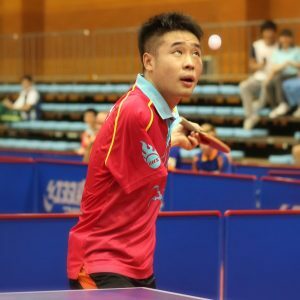 Interesting Story: Lin Ma is one of the greatest para table tennis players of all time. He started playing when he was just six years old has and does not seem to slow down as he goes for his third straight Paralympic singles title at Rio 2016. Having won the men’s class 9 singles world title in 2014 and then the Asian title in 2015, Ma remains the No. 1 player in the world in his class. In fact, he has been ranked in the top five in the world in class 9 for a number of years. Interesting Story: The No. 1 ranked men’s class 7 player will go for his first Paralympic title in Brazil. At just seven years old, he survived cancer. It was whilst recovering that Bayley found his love for the sport after his grandmother presented him with a table tennis table. One of his superstitions includes wearing the same T-shirt until he loses a match and drinking half a can of energy drink before he competes. Interesting Story: The right-handed South Korean class 4 player will defend his title in Rio. Holding 21 gold medals at major events since 2001, Kim will have to overcome competition from Turkey’s reigning world champion Nesim Turan. Kim debuted in his first ITTF tournament in 2001, and was elected best Asia/South Pacific Player of the Year in the wheelchair men’s category in 2005. Interesting Story: The young Belgian is making his debut at the Rio 2016 Paralympics. Ranked second after China’s Lin Ma the 2015 European Champion will be looking for a medal on his debut in the Brazilian capital. Laurens, who started with horse riding and later under the influence of his siblings switched to table tennis, is the younger brother of Belgium’s number one table tennis player Robin Devos. 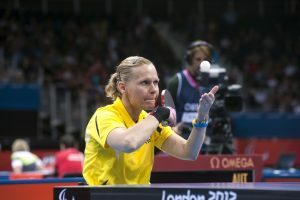 Interesting Story: Carin-Ahlquist will try to defend her Paralympic singles title in the women’s class 3. She won her third straight European title last year in Vejle, Denmark. But the Swedish athlete will have to overcome tough competition from China, notably the reigning World Champion Qian Li. Ahlquist was diagnosed with Multiple Sclerosis in the early 2000s. She credits her strong backhand and tactics as the keys to her success. 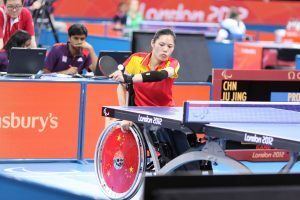 Interesting Story: China’s Jing Liu, the Paralympic Champion of 2008 and 2012, is well-known for playing her best table tennis on the world stage. Liu won the women’s singles class 1-2 at the 2014 World Championships in front of her home crowd. But the past few years, she has gone back-and-forth with South Korea’s Su Yeon Seo, posing an interesting matchup in Rio de Janeiro. 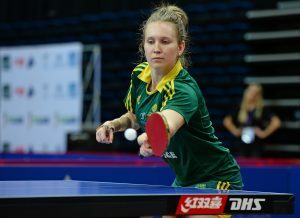 Interesting Story: Natalia Partyka is one of the most recognised para table tennis players on the international scene. Born without a right hand and forearm, the 27-year-old has competed two times in both Olympic and Paralympic Games (Beijing 2008, London 2012) and she will repeat this stunt in Rio. The Polish star captured the 2014 World Championship title in singles and added the European title to her resume in 2015. Partyka was 11 years old when she participated at the Paralympic Games in Sydney 2000. She became then the youngest player to compete at the Paralympics. Interesting Story: Paovic was a member of the Croatian women’s national table tennis team for eight World Championships, represented Croatia at the 2008 Olympic Games and entered the top 50 players in the world. Her career in the able-bodied side was cut short on 30 January 2009, by a life threatening car accident en route to the airport in Paris following a match. She suffered a severe cervical spinal injury leaving her with limited use of her legs. Holding European and World championship gold medals, Paovic is aiming to add her first Paralympic title. Interesting Story: Melissa Tapper will be the first Australian athlete to compete in both the Olympic and Paralympic Games. She has a brachial plexus which resulted in Erb’s palsy, causing paralysis in her right hand. At the 2014 World Para table tennis championships in Beijing (China) she won a bronze medal in the singles class 10 category. It was Australia’s first ever medal at the championships. Having studied Exercise Science, Melissa is passionate about keeping fit but also loves to indulge in the occasional piece of chocolate.